Thanks for choosing Midway Chevrolet as your resource for 2013 Chevrolet Cruze reviews. All Chevrolet dealers in Phoenix aren't the same. At Midway Chevrolet, we feel it's our job to serve customers with quality Chevrolet reviews that set us apart from the typical dealer. This article will tell you exactly what you're looking for. As your Phoenix Chevrolet dealer, you can entrust on us for authentic information on the 2013 Chevrolet Cruze. 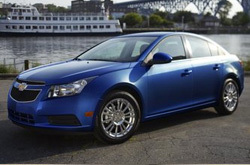 Read on to see if the 2013 Cruze should be parked outside your home. Check out the 2013 Chevrolet Cruze to versus similar autos like the 2013 Ford Focus, Hyundai Elantra, Mazda3 and the Honda Civic, and you will discover that the 2013 Cruze beats out those vehicles in gobs areas. Take a look at the reasons see why! 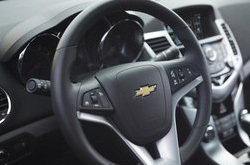 See inside the 2013 Chevrolet Cruze - view video here! Midway Chevrolet's car repair men and women have served Phoenix for years with fantastic workmanship and actual Chevrolet parts. Even the quality Chevrolets in Phoenix can take a beating, so turn to the Chevrolet service and autp repair masters in Phoenix at Midway Chevrolet. We handle a multitude of jobs, including everything from ordinary oil and filter changes and battery replacement to complex assignments like shock and strut maintenance and more. Beyond this you can bet on getting fair prices on all repairs, as well as awesome service every time you stopover at Midway Chevrolet. Take a look below to view money-saving service specials.